As of May 2017, the trails that allow us access to the lagoon of the Cerro Chato are closed, this by the MINAE - System of Conservation Areas. In order to improve the condition of the trails and infrastructure. Therefore, these excursions are suspended as of that date and until further notice. 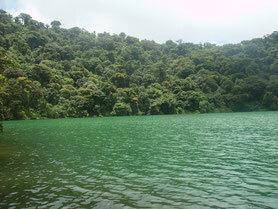 The Cerro Chato Hike is a rare opportunity to see one of the most beautiful volcano crater lakes anywhere. This is for serious hikers only. 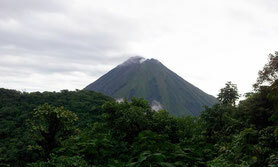 We began the journey transferring us from La Fortuna around the Arenal Volcano until the hotel "Observatory Lodge," there we began the walk toward the summit of Chato Hill through a very dense primary forest. When we arrived up we go to visit the lagoon on the top, in where everybody could swim if wants, besides taking photos and discover the surroundings. Then, we continue descending, always enclosed of a very dense forest, where you could appreciate birds, plants, animals, insects and immense trees, also enjoy the sensation of liberty having a beautiful views of the San Carlos Valley as well as of the Arenal Volcano. La Fortuna Waterfall, where we will begin to descend again in order to arrive on the dot base of it and enjoy a beautiful natural landscape that makes her very special. After a refreshing swim we will return to La Fortuna town by car. 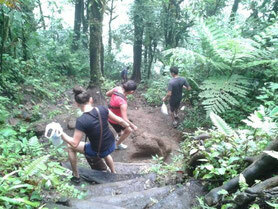 We recommend this Cerro Chato Hiking tour for people in good physical shape. Transportation from and back to your hotel, entrance fee at the Observatory Lodge, entrance fee to La Fortuna Waterfall, water, snacks, bilingual naturalist guide. Long pants, hiking shoes, insect repellent, hat.